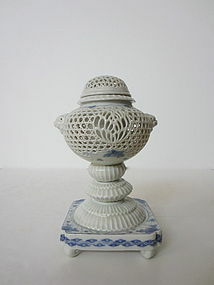 A splendid Japanese Hirado reticulated censer. 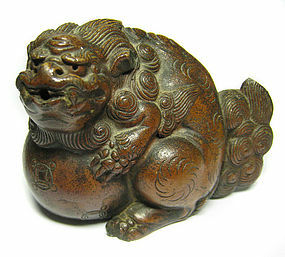 The censer has a reticulated lid and body with shishi lions on the side and chrysanthemum foliate decoration on the neck with a square base. Body and base has blue and white flower and crackled pattern. 19th century. Size: Length: 3.8" Width: 3.8" Height: 6.9". 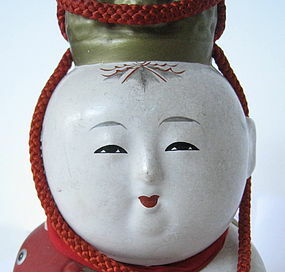 A cute Japanese gosho ningyo doll in the form of Ebisu, one of seven fortune gods. Handpainted detail work, red and brocaded fabric is used for the clothing of the doll. Meiji to Taisho period. Size: Length: 5.5" Width: 6" Height: 9.5". Rare and unusually large antique Chinese large ceramic tomb figure of a tall male attendant, beautiful dripping Sanchai glaze, slip painted face. 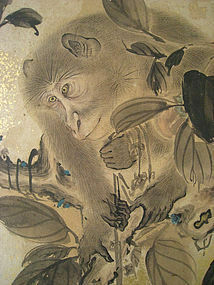 Antique Japanese 4 panel shoji screen (sliding door panels) painted with wonderful scene of monkeys in a persimmon tree, painted in sumi ink and light colors on paper with clouds of gold leaf flecks, 4 monkeys are painted in tree, a mother monkey holds a baby and another monkey looks on at the base of the tree, a stream flows through rocks nearby, beautiful detail, Shijo School, Meiji Period. Total size: 115" long x 68" high Size of each separate panel: 28 3/4" wide x 68" high each. Chinese antique molded cricket cage, with a dense floral pattern with a shuangxi, double happiness, emblem at the neck, with a lid pierced with a butterfly and flower design. Size: 6 1/4" High. Good condition, Republic Period, early 20th century. Chinese antique fencai porcelain dish with three circles of images of different blooming flowers with a pink sgraffito ground scrolling vine pattern surrounding the image. No decoration in the interior section. Apocryphal Yongzheng mark in a double ring, late Qing/Republic Period, 19th century or later. Perfect condition. Size: Diameter: 7.75" Height:2". Japanese pair of mirror image cloisonne vases with amazing details of phoenixes, dragons, birds, and other mythical animals in jeweled lappets and ruyi-heads and flower bands. Green cloisonne contains gilt-like effects. 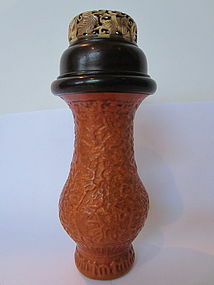 Mottled purple ground, Base has flower mark, gilt bronze end bands. Wonderful condition. Size: Width: 5.5" Height:12". Meiji Period, late 19th century. 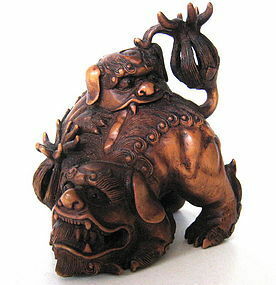 Japanese okimono of two Chinese lions one on top of each other carved of boxwood. No signature is found on the okimono. 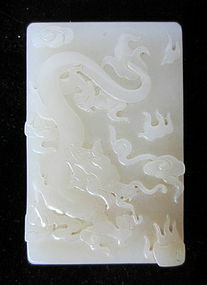 Size: Length:2.75" Width:1.5" Height:3.25".